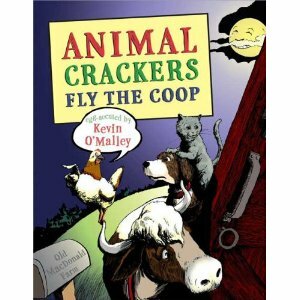 Animal Crackers Fly the Coop by Kevin O'Malley. Walker Books for Young Readers, Bloomsbury. 2010. The Plot: A retelling of the Bremen Town Musicians. Except instead of wanting to be musicians, the animals want to be comedians. Or, in the case of Hen, a comedi-hen. The Good: Hen just wants to open a comedy club and be a comedi-hen. Because she's concentrating on humor rather than laying eggs, the farmer warns of "Fry-day." Hen runs away, and encounters three other animals, Dog, Cat, and Cow, who ignore their expected jobs and instead tell jokes, riddles, and sing funny songs. Animal Crackers is full of the jokes and puns of Hen, Dog, Cat and Cow. Illustrations add to the tale; when we encounter Cat, Cat is so caught up in singing songs that mice are jumping all around Cat. A laugh out loud tale that will work with older readers, especially those who are in the loving puns and jokes stage.